Biometrics Market size was valued at over USD 12 billion in 2016, with 20% CAGR forecast for 2017 to 2024. Biometrics includes individual authentication by evaluation of unique biological traits. This authentication is possible through hand geometry, voice recognition, fingerprint identification, signature verification, among other ways. Biometrics is considered to have a better authentication reliability as compared to numeric codes and physical devices. Numerous technologies are developed to deal with individual identification with advancements in hardware, readers, sensors, pattern recognition, and image & signal processing technologies. 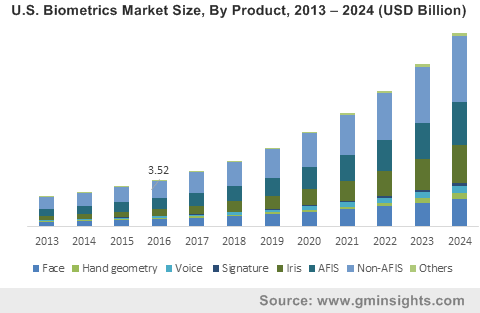 Growing implementation in various verticals such as mobile devices, healthcare, and financial institutes has positively impacted the biometrics market growth. With constant technological advancements, mobile banking has witnessed high acceptance among consumers owing to its security feature that has further propelled the industry growth. Moreover, increased usage in criminal identification coupled with government initiatives contribute to significant biometrics market demand. High implementation cost is anticipated to present a threat to the industry in the forecast timeframe. Uncertainty about stored data will hamper the industry as sensitive identification data contained in databases such as fingerprints can lead to unlawful access or misuse. Moreover, fear among the customers regarding inconvenience or privacy intrusion will act as a restraint to the biometrics market size. Non-AFIS market is anticipated to account for significant industry share in the forecast timeframe owing to its extensive usage in numerous applications including workforce management and cashless vending. The high revenue is attributed to its applications in public areas that ensure keyless entry and efficient overall security. Iris recognition market is expected to witness double digit growth from 2017 to 2024. It can be attributed to integration of iris scanners into smartphones on a wider scale. Various smartphones manufacturers including LG and Samsung have adopted this technique to enhance their security feature. Voice recognition is projected to grow at over 22% CAGR over the forecast timeline owing to its wide usage in mobile banking and various other applications in developed countries of North America and Western Europe. Rising need of security in interconnected and digital devices will contribute significantly to the growth. Technological innovations and increasing mobility are developing a new era for banking and finance services. In the past few years, financial institutions have incorporated biometric technology to authenticate customers, employees, and streamline certain operations; the banking & finance sector is set to grow at over 22% CAGR from 2017 to 2024. The biometrics market will have a tangible effect on the future of transport and logistics applications, providing vehicle safety and tracking systems. Each vehicle driver has unique biometric information that provides safety and necessary information to the management for enhanced decision making and individual performance evaluations. The transportation segment is expected to have highest revenue during the forecast period owing to benefits such as identifying billing anomalies, overhead reduction by excessive fuel consumption warnings, detecting unauthorized vehicle use, and reduced overtime expenses. North America is poised to grow at around 20% CAGR during the forecast timeline owing to favorable government regulations in the region. In the U.S., the Next Generation Identification Program includes fingerprint, facial recognition, and palm print that assures a repository of the criminal. Moreover, increasing presence of industry players will significantly contribute to the regional sales. Asia Pacific biometrics market is expected to showcase a significant growth rate owing to increased implementation of biometrics in China and India. In India, the National enrolment program (UIDAI Aadhar) includes logging in the biometric information for unique individual identification. Moreover, introduction of China Resident Identity Card Law by China requires scanned and recorded fingerprints of citizens for identification. The adoption has increased due to township projects at a large scale in Japan. 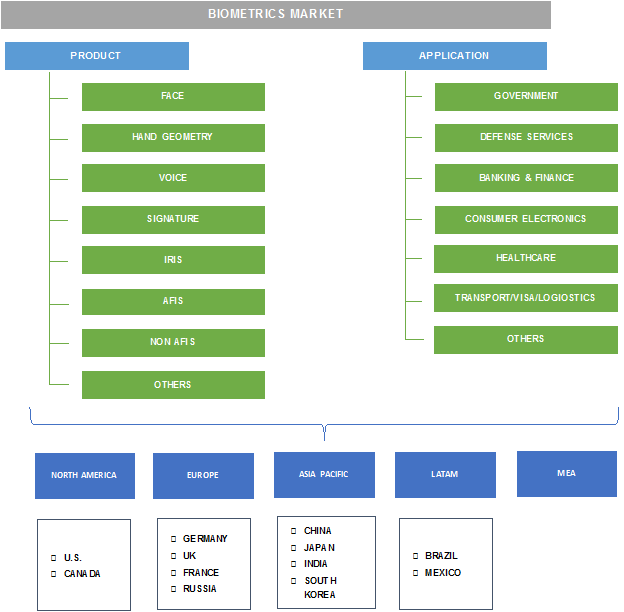 Europe biometrics market is anticipated to exhibit a significant share owing to wide usage in military and IT applications. 3M Cogent, NEC Corporation, BIO-Key International, CMI Time Management, EyeVerify, and Lockheed Martin are among the prominent players in the biometrics market. Other notable players include FaceFirst, GreenBit Biometric Systems, MorphoTrust, Smartmatic, Pradotec, etc. Industry players are focusing on strategic partnerships and alliances to strengthen their foothold. For instance, in June 2017, NEC Corporation entered into a strategic partnership with DMI and delivered enhanced biometrics & mobility to federal government. This system will provide front line safety, enhanced biometric access, and high speed and secure communication. In April 2017, the company rebranded its biometric and ID division and renamed it as NEC Advanced Recognition systems. In July 2017, Iris ID partnered with a Chinese medicine producer, Tongrentang. This partnership will escalate the utilization of the company’s iris scanners by all the employees of Tongrentang. In November 2016, Bio Key International signed an agreement with Shinden Hightex Corporation for selling the company’s Compact fingerprint readers product line in Asia to serve the demand for convenient online security in Asia Pacific. Biometric systems have an ability to provide an accurate and precise validation in comparison with the conventional methods that include PINs, passwords, and ID cards. These benefits have resulted in high implementation of these systems in private and public work spaces for authentication and attendance purposes. Consumer electronics market expansion along with increased smartphone customer base has also favored the biometrics market growth. Rising investments in military segment is anticipated to drive the growth in forecast timeframe owing to heavy adoption due to authentication purposes. Multimodal systems and cloud based solutions are emerging trends that have gained prominence in the biometrics market. With ever increasing new product launches and technological advancements, the cost of these systems is expected to decrease substantially. Increased acceptance across the industry segments coupled with government initiatives across the globe for enhanced security will have a positive impact on the industry growth.